Although driving around in an RV is a liberating and freeing experience, one issue that comes from using a motorhome on the road is that you have limited mobility. Driving your rig everywhere isn’t always conducive, which is why it’s great to have options. One of the best ways to add mobility to the RV experience is to bring your bicycle along for the journey. However, assuming that you don’t want your bike to clog up storage space inside your home, you’ll need a way to transport it. Today we’re going to take a look at the best bike racks for RVs and how they can make your next trip even more accessible. As we’ll see on this list, there are several different ways that you can bring your bikes along for the journey. In this case, we have a rear-mounted bicycle carrier from Swagman that makes the process simple and efficient. 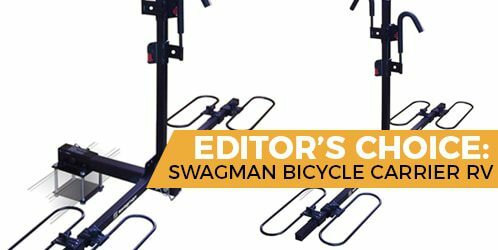 Not only that, but Swagman is one of the better brands in the bike carrier business. Let’s see what this has to offer. One of the most crucial elements you’ll have to figure out when picking the best bike rack for your RV is how it’s going to be mounted. In this instance, the rack can either attach to your RV’s tow hitch, or it can connect to the bumper itself. Having both options available is part of what makes this rack so desirable. If you need to tow something else with your RV, you don’t have to sacrifice your bicycles to do so. Attaching this rack to your mobile home is fast and efficient, no matter how you do it. Most RVers don’t travel alone, and the same should hold true for your biking excursions as well. Assuming that you want someone to ride along with you, you need a rack that can carry more than one bike. Although this particular model doesn’t carry the most bikes, the method it uses for securing them is much more practical and ideal than other models. The tires fit into the loops on the bottom, and a top hook holds the bicycles in place while you drive. Overall, it’s much more secure than other options. The rugged durability of this bike rack, coupled with the two mounting options means that this is one of my favorite models overall. I also like that the frame can fold into itself when you have to put it into storage, as well the fact that it holds the bikes so securely during travel. If you have bikes with wide handlebars, you may not be able to attach both of them to this rig, since it doesn’t stick out that far from your RV. Another issue that may occur with this rack is that the top hook can sometimes damage your bicycle’s tube during transit. I highly recommend putting something between them (like a towel) to ensure that this doesn’t happen. As I mentioned above, Swagman is one of the better brands making bike racks for RVs, so you can feel confident if you decide to purchase this particular model. Let’s see how it stacks up against the others. Although you can’t use the ladder when this rack is on it, removing it is as simple as pulling it off. The frame just hangs onto one of the rungs, meaning that installing it is much faster and more efficient than anything else we’ve seen. Also, if you need to adjust the position, simply put it on a different rung, and you’re ready to go instantly. This particular ladder-mounted bike rack isn’t as durable as the one above, considering that it can only carry 70 pounds. However, since most bicycles don’t weigh more than 35 pounds anyway, it shouldn’t be an issue. Additionally, since this rack is made of aluminum, it’s much lighter than other models, and it won’t rust or corrode if you leave it outside during the off season. Mounting your bikes to your RV’s ladder has never been easier. I like the rugged construction and the simplicity of this rack. The width of this model is not that great, so you may have to be creative about how you mount your bicycles if you want both of them to fit. Also, the straps used to tie them down are not as durable as the rest of the unit, so they may need to be replaced more often. Although holding two bikes is pretty much the standard for these kinds of racks, it’s nice to be able to bring more if necessary. Thus, if you’re in the market for a frame that can carry rides for everyone in the family, you may decide that this is the best option. One of the excellent features of this rack is how simple and effective it is. Although the mounting structure is not as secure as the Swagman above, it’s so much faster to put your bikes on and take them off. Simply set the rides into the rubber holsters, strap them down with the hook and loop straps, and you’re ready to go. Another great reason to buy this rack is that it can allow you to access the back of your vehicle if necessary, thanks to the folding arm design. I like that this model can fit on both RVs and any car or SUV with a hitch, meaning that you can use it for all kinds of travel. With the hinged arm, it’s also easier to put your bikes on and take them off, since you don’t have to lift them all the way up. Just lower them to the ground and remove them from the rack. The speed and simplicity of this bike rack are its best features. I also like that it can hold an extra bicycle if you need it. Overall, it’s easy to use and can work for both RV trips and any other adventures you may have. Unfortunately, the manufacturer of this rack doesn’t have excellent quality control, so the welding on the top hinge (where the bikes sit) may not be as strong as advertised. In rare cases, it may snap off, leaving you without a rack. Also, if you have any bikes without a straight top tube (like a girl’s bicycle), then it won’t work with this kind of setup, so be aware of that. Although mounting a bike rack to your tow hitch is usually the best option, it’s not the only way to bring your rides along. Mounting brackets like this one from Surco enable you to utilize one part of your RV that rarely gets used - your ladder. In some cases, mounting bikes to your RV ladder means that you have to remove the bracket if and when you have to crawl on top of your mobile home. Fortunately, with this rack, that’s not necessary, thanks to the folding sides. Once you remove the bikes from the unit, you can turn the sides and use the ladder as needed. This feature means that you can have this rack installed almost permanently if you like. One feature that I haven’t covered yet is the weight limit for your rack. Bicycles can be rather heavy, so you need to make sure that you’re not overloading the device, as that can cause bending and damage to both the rack and your rides. Thankfully, this particular model can hold up to 75 pounds, so you should be good with almost any full-size bicycle, even mountain bikes. If you’re going to mount your bicycles to your RV ladder, this is probably the best way to do it. I like that the arms swing out to allow you to use the ladder when necessary, and I appreciate the durability of the construction. If you RV full-time or you’re planning on being on the road for days on end, then this rack won’t be able to hold up to that kind of stress. It’s best suited for trips that don’t require the bikes to stay mounted for a long time, so keep that in mind. Another thing is that the mounting brackets are built for one-inch ladders. If your ladder is thinner or thicker, it won’t work properly. Before I get into the review for this Bike Bunk from Stromberg, I want to illustrate the fact that no rack comes with it. Instead, this model is designed to offer a tow hitch for your RV trailer so that you can attach a separate bike rack to it. The way that this device works is that it mounts to the A-frame on your RV trailer. Thus, if you have a standard motorhome, you don’t need to even worry about this model, as it won’t apply. The best thing about this unit is that it is tall enough and curved enough to go around most of the obstacles that could be in its way. Most RV A-frames have electrical boxes and other stuff behind the tongue (where it attaches to the tow vehicle), so you need to be able to circumvent those things. Overall, you should be able to get this in place and attach a hitch-mounted bike rack relatively easily, provided that you know what you’re doing. Another great thing about this model is that once you’ve installed it, you shouldn’t have to remove it. You may need to take down the bike rack from time to time, but this mounting bracket is rugged enough to stay on year round. If you have an RV trailer and you want to be able to bring bikes along, this is probably the best way to do it. I like that it’s durable and reliable and that it’s shaped well enough to avoid any obstacles that may be on your trailer’s A-frame. With a name like the Bike Bunk, you may assume that it comes with a rack. That’s why I prefaced this review by saying it doesn’t. Also, you’re going to have to be much more careful about choosing the right rack, depending on how far this sticks out, as well as the kind of tow vehicle you’re using. For the most part, this attachment works best if you’re using a pickup truck, where bicycles can stick out over the bed. If you’re driving a car or SUV, however, it may be a problem. How many bikes do you plan to take? Make sure that the rack can carry as many bikes as you plan on having. Will the bike rack obstruct any views? Make sure that it won’t cause any blind spots, particularly when backing up. If they’re different sizes, the rack may not be able to accommodate both, so be sure to measure them beforehand if possible. Although some racks make it easier to dismount the bicycle, you should plan on lifting the whole thing up and down whenever you use it. Consider how easy it is to mount and dismount your rides. If you want to use them consistently, buy a rack that accommodates that kind of usage. Do you have a hitch? If not, how big is your RV’s bumper? What about a ladder-mounted option? Consider all of the possibilities before making a final decision. Although most of the bike racks we looked at are high quality, I have to say that my top pick is the Swagman XC2. I like that it holds your bicycles in place much better than most other models and that it can attach via your tow hitch or bumper. Overall, if you like durability, convenience, and reliability, this is the bike rack to buy.